I always enjoy Leigh Tate's books, and her newest is no exception. But before I sing its praises, I want to make sure you don't miss out on her big summer giveaway. There are seven prizes --- one paperback version of How to Bake Without Baking Powder and six ebooks with topics ranging from growing ginger to making your own whitewash. To enter, all you have to do is leave a comment on her blog. Good luck! Okay, back to the book review. Tate outdid herself with her newest book, which is chock full of both historical data and actionable information. If you're like me, you probably understand the basics of baking powder/baking soda --- you can use the latter if you include an acid, but need the former if you don't. But I've been left scratching my head many times when I saw a recipe that called for baking soda without anything I considered an acid to prompt the leavening reaction. Tate's book explained why, listing many culinary acids I hadn't considered and also explaining that baking soda actually causes some rising action by itself at high temperatures (such as in cookies). "...have you ever heard of the idea of soaking wood ashes and using that alkaline liquid along with an acid to puff your biscuits up?" Yep. Learned that in an 18th Century cooking class when I used to do historical recreation at various historical sites. Plug: Take a trip to Rocky Mount in Piney Flats, TN. They have wonderful classes there on 18th Century cooking and gardening. This book sounds like something I should add to my library. Thanks! Best not try this at home. Amateur chemistry is best left out of your food! Eh, I guess I don't understand the point of this. 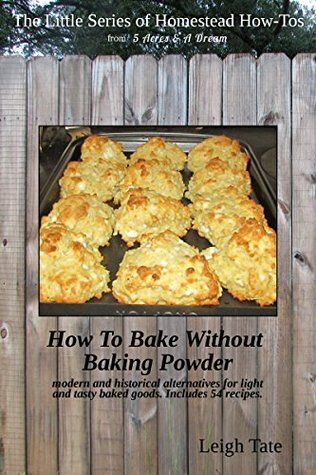 (But then, I don't seem to get the point of a lot of things...) Is this book intended for some post-apocalyptic time when baking powder is scarce or horribly expensive? It sounds like an interesting book, I always love learning more about culinary science. But if the world ends, I don't think anyone will be here to search grocery store shelves for baking powder!